The Obama administration is expelling Venezuela's consul general in Miami after allegations that she discussed possible cyber-attacks against the US while she was stationed at her country's embassy in Mexico. The state department said it had declared the diplomat, Livia Acosta Noguera, persona non grata and given her until Tuesday to leave. The department would not discuss the reason for the expulsion, and there was no immediate reaction from the Venezuelan government. The allegations were made in a documentary aired by the Spanish-language broadcaster Univision last month. 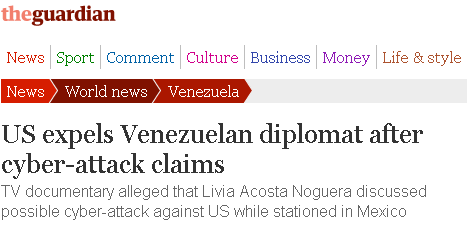 According to the documentary, Acosta discussed a possible cyber-attack against the US government when she was assigned as a diplomat in the Venezuelan embassy in Mexico. The documentary was based on recordings of conversations with her and other officials, and also alleged that Cuban and Iranian diplomatic missions were involved. Citing audio and video obtained by students at the National Autonomous University of Mexico, Univision said Acosta was seeking information about the servers of nuclear power plants in the US. After the documentary aired, the state department said the allegations were "very disturbing" and officials said the FBI had opened an investigation into the matter.